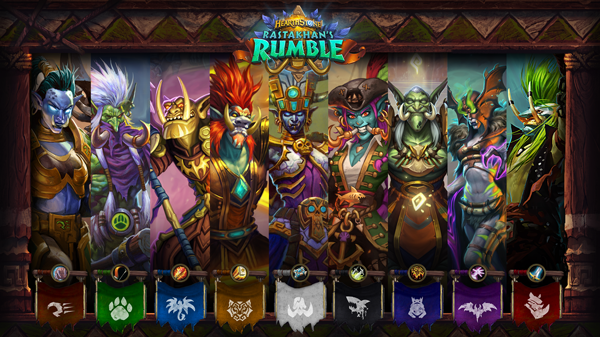 Head on over to the Rastakhan’s Rumble Team Spirit webpage, log in with your Battle.net account, and choose which team speaks to you! Does the ferocity of Wardruid Loti and the ferociously-named Gonk the Raptor fill your heart with fervor? Or are you the master of disaster, ready to charge into the fray with War Master Voone and Akali, the Rhino? The choice is yours! Choose one of the teams that best represents you and earn one card pack from Rastakhan’s Rumble that you can tear open after Rastakhan's Rumble is released! It’s that easy! *UPDATE: The bonus Rastakhan’s Rumble card pack from Show Your Team Spirit will be available soon after Rastakhan’s Rumble is released on December 4. Once your Rastakhan’s Rumble pack is awarded, it will automatically appear in-game.